In vedic parlance soma is not chandra, the moon. There is mishmash in these nomenclatures. Here we have to continue with chandra, the moon. an+uttaram – also means - not, excelled by later time objects – unexcelled. Some read garbham as yet-to-be-born boy. But the boy has already emerged with tear-like moonlight shed from the eyes of sage atri. If that boy is unborn yet, ‘the deities wanted to enceinte him in their wombs... but their womb aborted the boy for his chilliness...’ would be the forced meaning - piNDitArtham. Epithetically moon is always reckoned as a boy, rather a mischief-making boy. nidhi= aashrayam; as with the sun protecting fire, moon protects the coolant nature of water and some other items, hence waters have a haven in moon. rAja-rAjye = sAmrAjya vidhAnena = in a self-governing mode. sapta viMshati indoH – indoH bhAryA iti sheShaH – take it as ‘wives of indu’. Here soma is taken as a pitR^i-devata; somavatAm varaH= one who is the best among pitR^i-devata-s, fatherly gods; somaH = sudha-amshu karpUra kubera pitR^i-devate – iti vishva kosha; reminding that soma receives offertories given in shrAddha only to nourish the world with them, as said in pitR^i-kalpa. These deities can be said approximately as; sini = sinivAli= the day before no moon day –the night of caturdashi before amAvAsya; kuhu= the day later to no moon day - the night of pADyami after amAvAsya; dyuti= luminosity; puShTi = vivacity; prabha = fluorescence; vasu= brightness; kIrti= honour; dhR^iti= constancy; lakSmi= prosperity. The moon also got attendance alternately from his 27 star-wives called ashvini, bharaNi et al during the period of ritual, besides these nine goddesses. Because of the rivalling nature of these two, shukra and bR^ihaspati, from the days of their studentship under a~Ngirasa, the father of bR^ihaspati, bR^ihaspati became mentor of gods while shukra-AchyArya became the mentor of demons. Incidentally god rudra is also a student of a~Ngirasa and amiable to co-student bR^ihaspati, and even to the other bhArgavA-s, say other brAhmaNa-s. saH rudro bR^ihaspateH pituH a~NgirasaH shiShyaH – nk. aja-gAvam – ajasya rudrasya; goschaH shR^ingAbhyAm nirmitam - a bow made with the horns of the bull of rudra; or, nandi, the bull-vehicle of rudra got into the state of rudra himself and attacked demons like a bow, as it were. 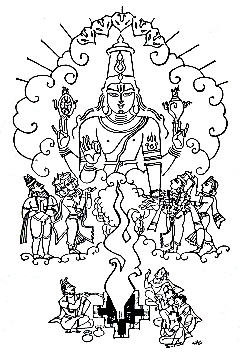 tArakA-mayam – tArA nimittam saMgrAmam – a battle for the sake of regaining tAra from chandra. antaH-prasavAM = about to deliver. a+yoni= ava+sthAne= in an unbefitting place; uncongenial place for just born babies; dasyu-hantamam= atishayena dasyuunaam hantaaram = an intrepid enemy destroyer; akShipat= sva tejasaa tiraskaaram= hit back at; pay someone back in his or her own coin. Here nIlakaNTha says: mAtaram vinA brahmA api garbhasya dhAtAram na veda iti bhAva: none can know who impregnated a woman, even if he were to be all-knowing brahma, excepting that mother-to-be. The moon is said here as dhAta= garbhasya AdhAyakaH = god awarding scatheless pregnancy; tataH eva prajA pati= hence the lord of progeny. We generally say first-night as garbha dAnam scene. It is neither donation, nor dole, nor any charity bestowed on the bride, but it is garbha aadadhaanam – pregnancy, bringing about; a joint effort to get good progeny with god’s grace, lest malfeasant progeny is destined. Hence, moon stands witness for it. c.f. chapter 10 for the legend of lady ila. Thus, this is the twenty-fifth chapter of first canto called harivamsha-parva, in harivamsha-purANa, the sequel of mahAbhArata, narrating the legend of soma, the moon.